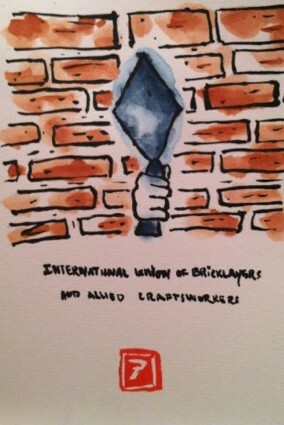 A couple of weeks ago I was walking around Chinatown in DC and wandered past the International Union of Bricklayers and Allied Craftsworkers. I was struck by the Soviet-style, workers-of-the-world-unite type of imagery and took a photo. Here’s an etegami of it.